As another classic analogue processor is resurrected, we ask what made it so special, and find out how faithful the latest incarnation is to the original. The latest version of Apple's entry-level music software draws heavily from Logic Pro X. Is this the return of Logic Express? Arturia’s new Brute is even smaller than the last and, quite frankly, very cheap indeed. What’s not to like? If you don’t need a large control surface, these two racks offer compact and affordable ways to harness Behringer’s X32 mix engine. Looking for a set of headphones that offer good isolation? Here’s our selection of models from some of the leading brands, with links to the SOS review where available. The tiny 8 Step Program is capable of all sorts of creative CV control. BFD2 was always going to be a hard one to top, but that hasn’t stopped FXpansion from trying. Have they succeeded? Heavyocity’s latest contender delivers a winning one-two combination. The latest version of iZotope’s RX restoration suite does more than before — and does it faster! JBL’s new LSR3 series brings technology from the company’s premium monitor range within reach of the home studio. Does this in-depth guide tell you everything you need to know? One-shots, transitions, drops, sweeps and swooshes are all types of effects that add those last finishing touches to a track. By the look of it, a great deal of time and effort has gone into designing NI's Kinetic Metal interface to ensure that it functions as a very flexible sample-manipulation tool. Making quality stereo recordings has never been cheaper, thanks to the launch of Rode's new M5 mic set. Audio files to accompany the reviews. Schoeps's unusual new vocal mic could give some of the long-established studio stalwarts a serious run for their money. Can this tiny amplifier really sound as good as a full-sized amp? Action Cuts is the latest addition to Ueberschall's Elastik-based 'Inspire' series of sample libraries. Waldorf have followed up their '90s blockbuster with a sequel — the Pulse 2. Create custom impulse responses using Space Designer. Studio One’s virtual guitar amp offers a surprisingly wide range of tone-shaping options. Media files to accompany the article. Following on from last month’s article about drum miking, here we’ll discuss the various ways you can mix and process your drum-kit mics. We introduce some of the best free plug-ins for Pro Tools 11. Proving that not every pop star is a manufactured creation, John Newman is as at home in the studio as he is on TV. When it comes to step sequencing, Reason 7 has all sorts of tricks up its sleeve. Our engineer figures out how to apply just the right amount of polish to an indie-rock track with a DIY aesthetic. Live enters a state of flux as we get to grips with morphing. Use Melodyne Essential, included in Sonar X3 Studio and Producer, to turn your audio into MIDI. The End Of The Loudness War? As the nails are being hammered firmly into the coffin of competitive loudness processing, we consider the implications for those who make, mix and master music. 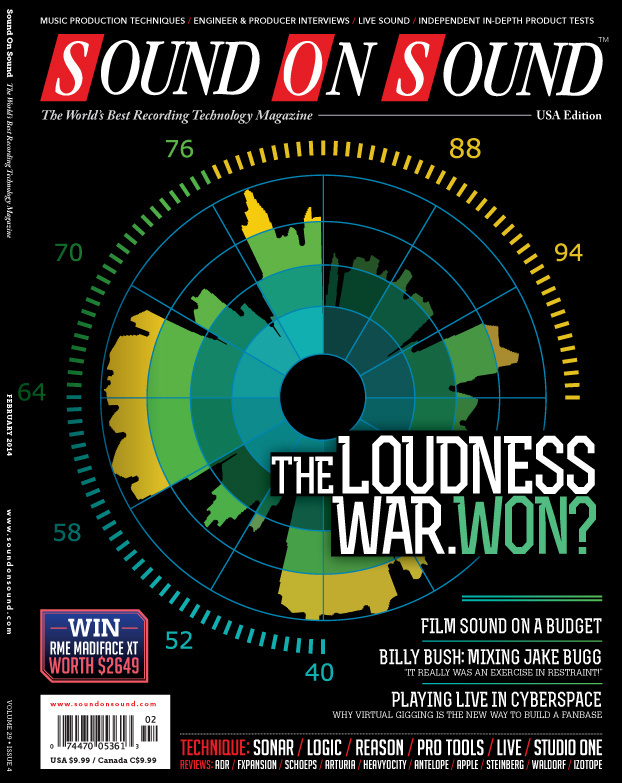 Read more about The End Of The Loudness War? This month we analyse hits from Storm Queen, The Reflektors and Lorde plus our classic mix 'Roxanne' by the The Police. While Tom Petty and Jeff Lynne’s writing partnership was certainly successful, it was the partnership between Jeff Lynne and engineer Richard Dodd that gave the records their distinctive sparkle. Management Speak Is Taking Over! Management speak is taking over the world. Ask pretty much any musician planning to make a record what mastering is all about and they'll probably include 'making it sound loud' as one of the more important mastering tasks. Read more about War Is Over! The Internet is changing every facet of the music business — including live performance. There's never been a better time to take to the cyber-stage. With '8 hate' remaining strong, Microsoft haven't had the best of years. Is that all about to change? Q. Can I balance my mixing desk inserts using a patchbay? I recently bought an old analogue mixing desk, where all the channel and bus insert points are unbalanced, which is quite common, I think. But all my outboard gear has balanced inputs and outputs! Read more about Q. Can I balance my mixing desk inserts using a patchbay? Q. Should I pad or DI a line-level signal? Read more about Q. Should I pad or DI a line-level signal? The world is full of products that promise to make our music better. But will clients or audiences notice the difference? Nashville is fast becoming the US's capital of music, but it risks losing its identity in the process. Our story begins with one of the most famous names in the history of recorded music: Bill Putnam. Media content for the February 2014 issue.